Prepare your website for battle this year with a bionic makeover! Going into the busy season soon, there’s no better time than August’s summer lull to re-calibrate and prepare for a busy fall. The web economy is growing faster than ever, and you need to get your website ready for action. Below is a an extended checklist of action items you can do right now to make your site look like a million bucks (or six million!) with better SEO, stronger marketing and faster performance. You can also call the ‘corePHP’ team at (269) 979-5582 to upgrade your site to a bionic website. SEO Audit: Ensure your site’s content, meta information and site architecture are all working together to engage more customers and trim your bounce rate. Security Audit: All your investment can go to the dogs if you get hacked! Take preventive measures from hackers and pests, and save yourself from untold misery. Custom Template & Extensions: Trim your site’s footprint with made to order solutions, rather than bloated, multi-purpose templates or components. Performance Tune-Up: Just like changing the oil in your car, you should do a thorough website and server performance tune-up regularly, at least once a quarter. Get Dedicated. If you can, get off that shared sever, and go cloud or dedicated server. You’ll quadruple your speed, and speed is what you need.. Content Purge: Stale content is nothing but ballast, dragging your site down. Keep your evergreen content, but dump the outdated junk. Integrated Marketing & Sales. Tie your content, marketing and sales together into one seamless process and digital experience for your customers, and watch your conversion rates soar! Caching & GZip Compression. Make sure once you’re done developing your site and its content, toggle these important features “on,” to save precious resources and speed up your site! Disable Unused Extensions. If you’re not using an extension, disable it. If you can get by with Tiny MCE vs. JCE Editor for your bloggers and day-to-day editing, do it, and save yourself a ton of resources. OK, that’s the list, to make sure you’ve got all the makings of a bionic website. If you’ve got additional suggestions, comment here. 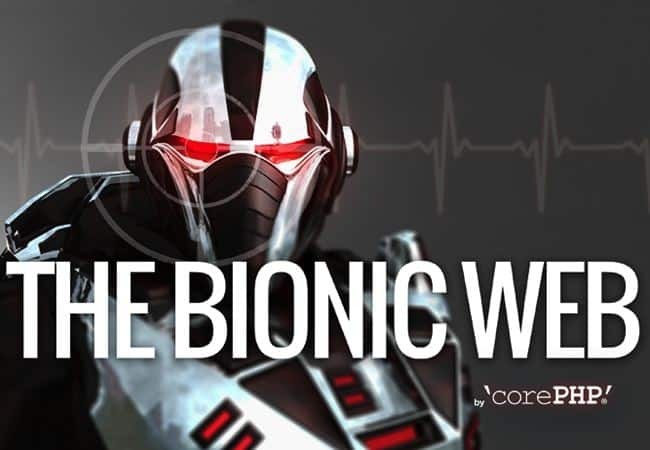 If you need help going bionic with your site, ‘corePHP’ is always available for you. So you too will have the capability to rebuild your website, and make it better than it was before! This entry was posted in Technology Advice, Web Design and tagged Advice, Bionic, Bionic Web, SEO on July 28, 2015 by John Coonen.